Inlabtec has published a short article that discusses the benefits gained from use of application specific sterile plastic bags in microbiological food testing. The article compares the now standard protocol of using sample preparation bags for stomaching** with how the Inlabtec Serial Diluter makes it possible to now perform serial dilutions in dedicated serial dilution bags expanding the use of bags as a cost and resource saving alternative to test tubes or cups prefilled with diluent. In stomaching a sample together with diluent is put into an inexpensive, sterile plastic bag which is vigorously pounded by paddles when placed inside the paddle blender. Using disposable sample preparation bags eliminates the considerable labour required to clean and sterilise reusable homogeniser cups, running costs are thus drastically reduced. Consequently, stomaching samples in bags quickly became the standard method of homogenising samples and is now referenced by thousands of users. In microbial testing, homogenised foods samples are used for viable cell counting where in most cases serial 10-fold dilutions are mandatory. Since the end of the 19th century, serial dilution protocols have dictated that 1 ml of homogenised sample is added to 9ml diluent in a test tube, vigorously mixed and then aliquots taken for the inoculation of culture media. The used test tubes are afterwards washed, refilled with the diluent, capped and sterilised again. This time-consuming recycling of test tubes is nowadays often substituted by using prefilled test tubes or cups which considerably increase purchase, storage and waste disposal costs. 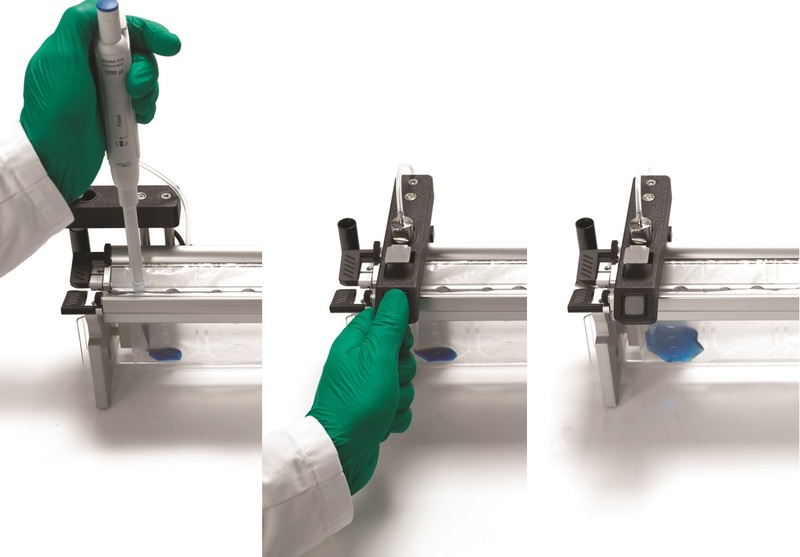 First introduced in 2014, the Inlabtec Serial Diluter pioneered the use of dedicated Serial Dilution Bags as an alternative to the traditional test tube techniques. Now proven in a rapidly growing number of food testing laboratories worldwide, users of the Inlabtec Serial Diluter have particularly appreciated that dilutions are considerably simplified and that the costs to undertake microbiological sample preparations greatly reduced. By using Serial Dilution Bags, the entire dilution process is now much less labour intensive and time-consuming, key contributions to a more comfortable and stress-free working environment. With a simple press of a button - Inlabtec Serial Diluter users are routinely able to obtain perfect dilutions leading to improved accuracy and precision of their testing results with minimal waste produced. In the same way that the stomacher became the standard method for sample preparation already many labs are successfully working with the Serial Diluter. Many of these users are ISO 17025 accredited labs who are benefiting from substantial improvements in their testing productivity and the quality of their food testing results as well as to manage their responsibilities towards employees and the environment. ** The stomaching principle was patented by A. N. Sharpe and A. K. Jackson in 1972.